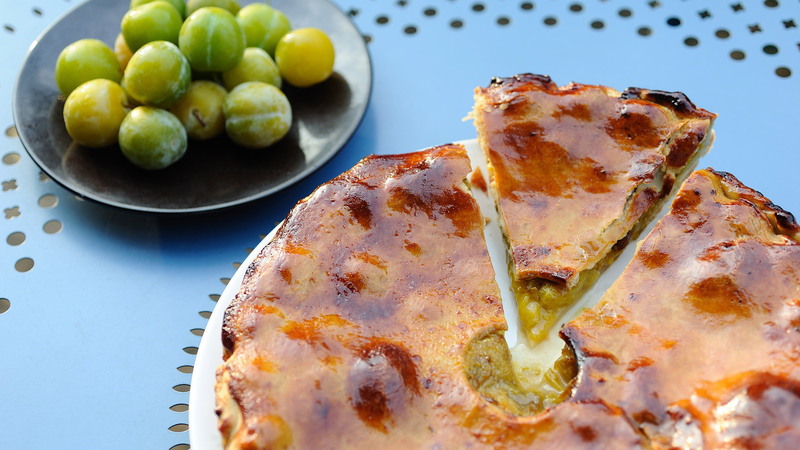 This Plum Pie (in French, Pâté aux Prunes) is the traditional pastry from Anjou by excellence. It is a familiar treat for residents of Angers and is even certified by the Heritage Inventory, who explain that the word ‘pâté’ here means “in pastry”. This Anjou dessert used to be prepared in “puppet” pastry, in other words, without a tin, cooked on a pastry sheet. The pastry is used to make a circular short-crust pie filled with plums. It is easy to make at home and is a simple and affordable dessert that is sure to please your dinner guests. It’s not worth bothering taking out the plum stones, since keeping them in will only make the cake better and tastier. Make the pastry by mixing the flour, sugar, butter, egg, salt and water together. Leave to rest in a cool place. Grease a tart tin. Roll out just over half of the pastry with a rolling pin and line the tin, allowing 1-2cm to overflow at the edge. Sprinkle with sugar. Arrange the plums on top. Make the pie lid with the remaining pastry. Place it on top of the plums, closing it at the edges. Brush with egg. Make an opening of 3cm in the centre in the shape of a cross. Place in a hot oven to cook (180°C) for 35-40mins. Enjoy with a glass of Coteaux du Layon.